Remember the old record player that you put out to pasture 15 or 20 years ago? Turns out that that "dead" technology offers the potential for sound quality that's far superior to what you're hearing from your CD collection or your MP3 player, so much so that the joys of vinyl are being rediscovered by a new generation of music fans. We take a look at three turntables for music lovers of any budget that will put your iPod on the defensive. The past decade has seen digital media almost completely subsume the consumer entertainment world. HDTV is an all-digital standard; DVD has all but killed off old-fashioned analog VHS; cell phone networks have long since gone digital--the list goes on and on. The music industry was a trailblazer in digitization, with the compact disc laying the groundwork for the current MP3 era. But this seemingly inevitable march toward the digital future has prompted a widespread misunderstanding; while digital media is undeniably more convenient than its analog equivalent, it is by no means guaranteed to be superior. And there's no better example of this than the vinyl record. The LP is fast approaching its 60th birthday, but audiophiles insist that the medium's sound quality remains unmatched by any CD, MP3, or other digital audio technology to date--it's the next best thing to being there, with real live musicians. That superior sonic fidelity is why this decidedly analog technology has maintained a devoted niche market in this digital age. According to industry stats, sales of LPs doubled in 2004--all the more impressive because this growth came at a time when CD sales are headed south. Of course, you'll need a turntable to sample the glories of analog sound, so we picked three contenders, starting with Sony's PS-LX250H ($99), then stepping up to Goldring's GR 1.2 ($429) and Music Hall's MMF-5 ($629). Whether you're an avowed vinyl aficionado looking to upgrade your aging turntable, you're itching to unleash that old collection of records boxed up in the basement, or you're just interested in dipping your toe into the vinyl pool for the first time, at least one of these modern gramophones will be sure to get you spinning. Turntables are, in fact, record-playing systems made up of three parts: the main housing, the tone arm, and a phono cartridge. The main body includes the base, the motor, the drive system, and the platter. It supports the tone arm, which in turn holds the phono cartridge. Phono cartridges have a stylus (a.k.a. a needle) that traces the LP's grooves and converts them into an analogous electrical output signal. Each subsystem plays a part in the quality of sound you hear. The cartridge's micro stylus traces the groove's wiggles, some of which are smaller than a wavelength of visible light--and it's that degree of required precision that separates cheap models from higher-end phono cartridges. But all cartridges are supersensitive vibration detectors, and they can't distinguish between the music encoded into the LP and any noise or vibrations that are generated by the turntable's motor, the tone arm's bearings, or the sound filling your room. Higher-end turntables provide superior isolation from those noises and decode more of the sound of the record itself. It's the same deal with the tone arm--it always moves on some type of bearing, and better tone arms have quieter bearings. Add it all up and the best turntable systems dramatically reduce the apparent surface noise--the clicks and pops associated with vinyl records--making it less intrusive so that it fades into the background. Turntable setup typically involves putting the platter on the bearing or spindle, slinging the drive belt over the motor pulley, and mounting the counterweight on the tone arm. (We opted for more audiophile-friendly belt-drive turntables, not the noisier--but DJ-friendly--direct-drive models.) None of this requires great dexterity or mechanical ability, but it's more hands-on than plugging in a DVD player. This is, after all, a high-maintenance medium; many current turntables--including the Goldring GR1.2 and the Music Hall MMF-5 in our roundup--require users to manually move their drive belts when switching from 33.3rpm LPs to 45rpm singles. But if you fully appreciate the analog sound, it's definitely worth the extra effort. 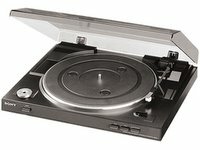 The Sony is an automatic turntable; after you place the record on its platter, just press the start button, and the turntable's tone arm lifts from its rest, moves into position over the record, and gently lowers the stylus onto the record. Once the PS-LX250H has played the entire side of the LP, the arm automatically raises and returns to its rest, and the turntable turns itself off. The Goldring and Music Hall turntables are manual designs, meaning that you must jockey the arm up and down yourself. Virtually all higher-end turntables are manual models, while budget models tend to be automatic. Before you buy a turntable make sure your receiver has inputs labeled phono. If it does, you're set; but if not, you'll need to either buy a turntable with a built-in phono preamp such as Sony's PS-LX250H or buy a separate preamp to hook up between the turntable and your receiver or HTIB. There are a number of models on the market priced from less than $100, but we like the Parasound Zphono ($149). We didn't have a Zphono on hand, so we used a receiver with phono inputs, a Yamaha RX-V2600, for all of our listening tests. Once you have the hardware nailed down, of course, you'll need some actual records to play. That can be a challenge in today's iPod-ified world, but persistent shoppers will find a treasure trove of music. We've bought hundreds of used LPs for less than a buck apiece at yard sales and thrift shops, and online markets such as eBay are always a rich source for good deals and expensive rarities alike. And you're not just restricted to decades-old music for your turntable: recent albums such as the Rolling Stones' A Bigger Bang are out on LP, as are new releases from many of today's top artists, including Beck, Cat Power, Death Cab for Cutie, John Mayer, Sufjan Stevens, the Strokes, Lucinda Williams, and the White Stripes--just to name a few. You won't find these LPs at your local Wal-Mart, but larger media hubs (think Virgin Megastore) still tend to have a section for vinyl. It's easy for the cynicism to kick in: quirky manual operation, delicate scratch-prone media, a limited selection of music, and no portability option. If you already have thousands of your favorite songs on your iPod, why bother? The answer is, quite simply, you don't know what you're missing. Why vinyl sounds better than CDs and MP3s is an ongoing debate, but we think it's a question of resolution of fine detail. Real, live sound has infinite resolution, but digitalized music contains a finite number of samples. For CDs, it's 44,100 samples per second. That might like an adequate number of samples to reconstruct the sound of a piano or a guitar, but when you stop and consider that the distinctive sound of every instrument and the human voice is produced by a fundamental frequency and a complex series of higher-frequency harmonics, you might see that's where digital falls down on the job. The number of samples available to faithfully reproduce the shimmer of a cymbal or the sweetness of a violin are too few. That accounts for digital's harshness compared to sample-free analog, which can capture music's harmonics with ease. In recent years, more obscure digital formats--SACD, DVD-Audio, and lossless digital codecs such as FLAC--have narrowed the sound-quality gap with analog to the point at which only golden-eared audiophiles could even hope to hear the difference. Be that as it may, LPs retain a retro appeal and a visceral aural aesthetic that an endless stream of bits and bytes will never be able to equal. Rather than fade away and die like 8-track, audio cassettes, and (soon) VHS videotapes, the vinyl market seems to be on track to maintain--and even expand--its boutique appeal as the best way for discriminating listeners to enjoy music.